Salmon is the common name for a species of ray-finned, anadromous fish. This means that salmon lay their eggs in freshwater, migrate to the sea or saline waters, then return to freshwater to reproduce. Salmon has earned a reputation as a health-supportive food thanks to the wealth of nutrients found in the fatty flesh. Salmon is an excellent food for bone health. Selenium, a trace mineral, protects bone marrow cells while the protein calcitonin enhances calcium uptake for greater bone density. Regular intake of salmon can keep eye-related ailments at bay. Flavonoids and essential fatty acids have protective antioxidant qualities on the eyes, thereby diminishing the likelihood of retinal dryness, vision loss, eye fatigue, and even macular degeneration. Those who want to lose weight should stock up on salmon. 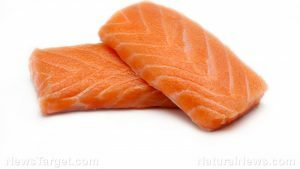 A high-protein food like salmon encourages metabolism and regulates the hormones that control appetite. Equally important to weight loss is the fact that salmon is relatively low in calories: A 3.5 ounce serving of wild salmon has a little over 182 calories, while a similar portion of farmed salmon yields only 206 calories. Meanwhile, the high concentration of potassium in salmon prevents excessive fluid retention. Salmon can be bought in different forms. Fresh salmon is typically sold whole or as fillets; canned, frozen, smoked, and dried salmon are available too. Canned salmon is the most convenient and inexpensive alternative to fresh salmon, with the added bonus of maintaining the same nutritional profile. As a highly versatile fish, salmon can be prepared and cooked in a variety of ways. Salmon is delicious baked, grilled, fried, and poached. This fatty fish does well as a chowder or patty, and pairs nicely with rice and green, leafy vegetables. Since salmon is easy to digest, elderly or sick individuals who struggle to keep food down can turn to this fish for high-quality protein. Eating adequate amounts of salmon can reduce the risk of developing eye-related ailments. Salmon is also an excellent weight-loss aid.